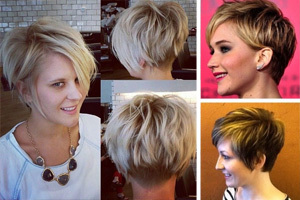 When it comes to decision-making, many women say choosing a new haircut and color is one of the hardest! 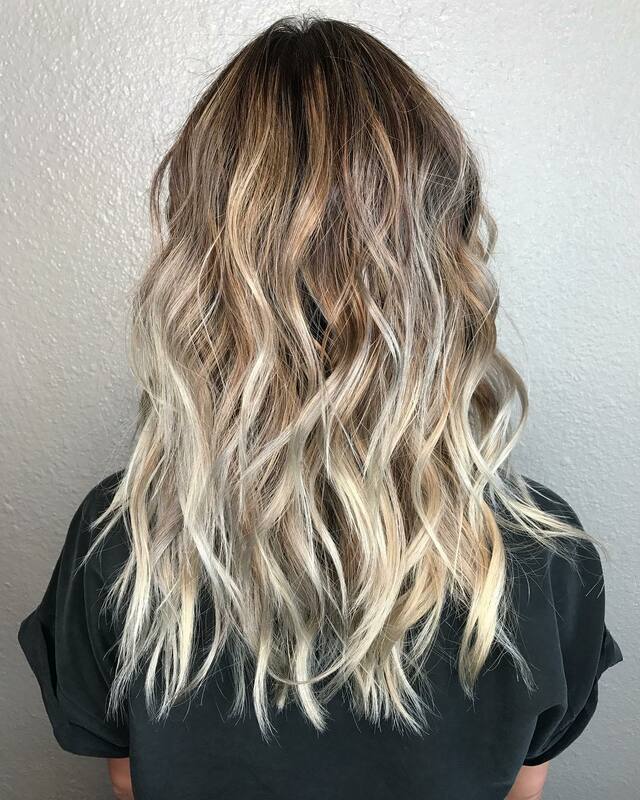 So along with this helpful gallery of the latest wave patterns, colors and balayage, try my simple method of narrowing down your final choice! Start taking notice of hairstyles worn by friends, family and colleagues and make a mental note of what you don’t like. Next, notice what hairstyle features add something good to their personal image. I realize not everyone has the same face-shape, age-range or fashion style etc., but this really helps to narrow down what you want from a new hairstyle! 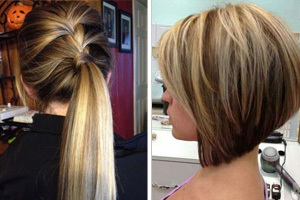 Finally, look in a well-lit mirror at home and rate how much your own haircut and color is adding to your beauty image. 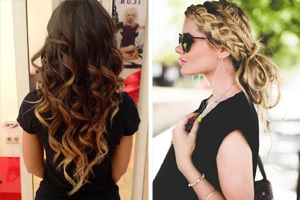 If you can’t honestly give yourself a 10/10 score, choose a trendy makeover from these chic, new medium wavy hair styles! 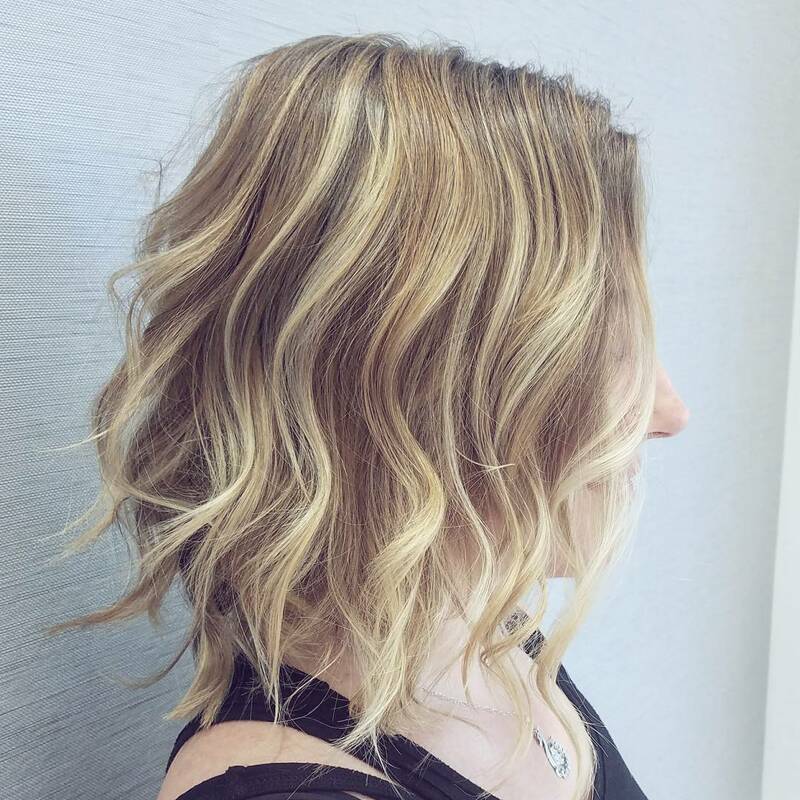 Texture is a key detail in this medium wavy hairstyle’s appeal, so the colorist has kept the blonde balayage fine and subtle in this makeover. This is an important factor to consider when you choose to add balayage, because it should highlight a pretty feature, without over-powering it. Medium-beige highlighting around the face is a great way to soften and flatter your complexion. And choppy, textured tips add a modern, edgy vibe to any lovely new look! Although this is an all-over, ash-blonde hair color, the colorist has expertly varied the toners, avoiding the flat, one color effect. It’s a subtle technique using dual-highlighting colors just one tone away from the main ash-blonde shade. 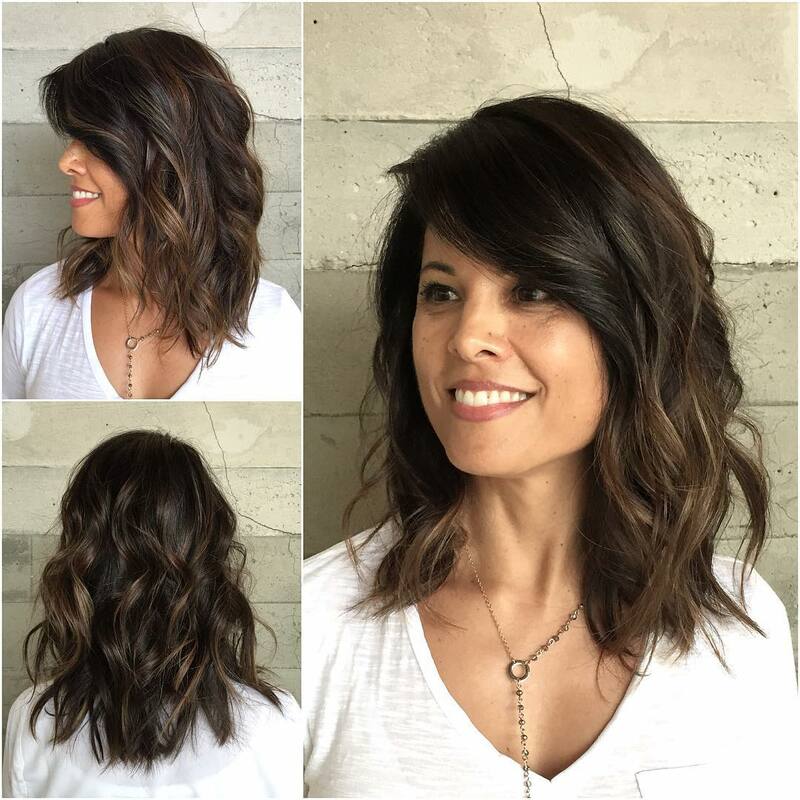 In this casual, wavy hairstyle the talented colorist has added subtle, gray low-lights around the head. And below that, the tone is a very pale yellow ombré from chin to the tips! 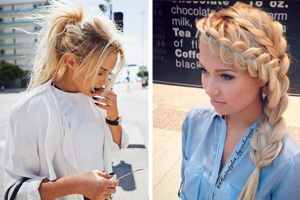 And in this trendy, easy-care hairstyle you can add extra texture, volume and wave just by tousling your hair! I love this style because it’s fun, without going over-the-top, and the waves create a lovely pattern in fine hair! Fine hair can be worn successfully in medium hairstyles, if you don’t go too long. Shoulder-length is a good limit to set, because fine hair is so easily weighed down by longer lengths, making it appear thin and lank. 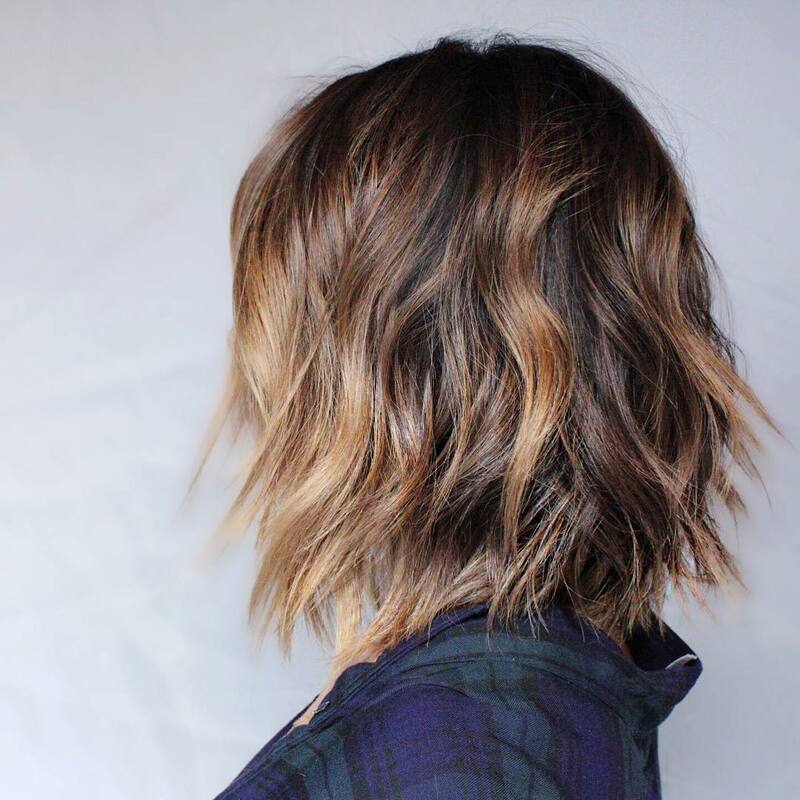 This fashionable style is an A-line bob with long layers and approximately four colors in the trendy blend. And to get the appearance of more volume and thickness, the cute twisted-out spiky tips add an attractive, playful vibe! 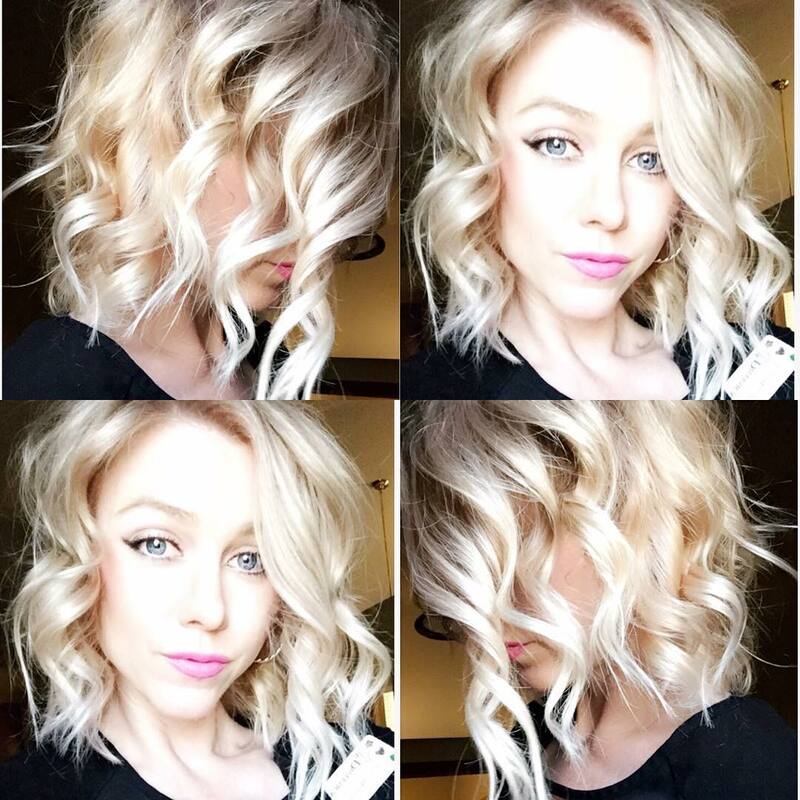 This new, pearlized pale-blonde shade creates tons of attractive personality on lively, defined ringlets! It’s actually a pale, golden-blonde, which can’t be beaten for reflecting flattering light onto a young face. Very light blondes suit women with blue or green eyes and pale skin with cool undertones best. This alternative to platinum-blonde with dark roots, is a softer shade from the trend away from harsh ‘street’ style. The colorist has added beige roots and you can see an intense gold tone in the bends of the casual twists! The colorist who created this beautifully executed color design, shows how to wear a bright look that’s not at all brash! Like all the modern colors this year, beige in the mix mutes bright colors for a beautifully soft finish. You get lots of 3-D color depth from the copper, gold and ash-blonde-silver ombré on medium or fine hair. And waves in thin, defined strands are the latest way to get a casual, shaggy finish on fine hair! 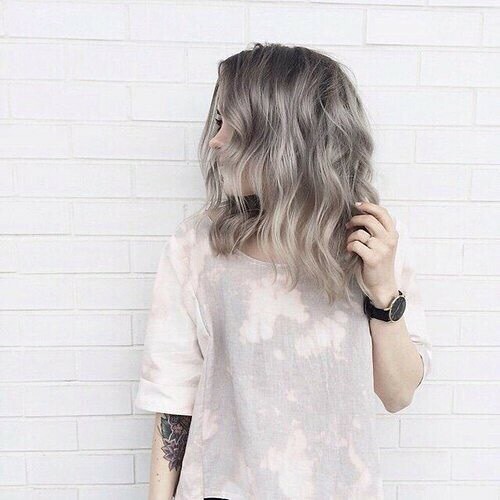 This is a softly sophisticated hair design in attractive shades of gray, ash-blonde and ash-beige ombré. There’s a hint of lavender toner in the gray roots and ash-blonde in the middle color band, changing imperceptibly to beige on the tips. If you look at the tips on the left side, you see that the colors have not been applied in the usual symmetrical design, adding a quirky touch that suits the model’s personal style perfectly! Gentle waves complement the soft vibe of this gleaming, feminine look on silky hair! 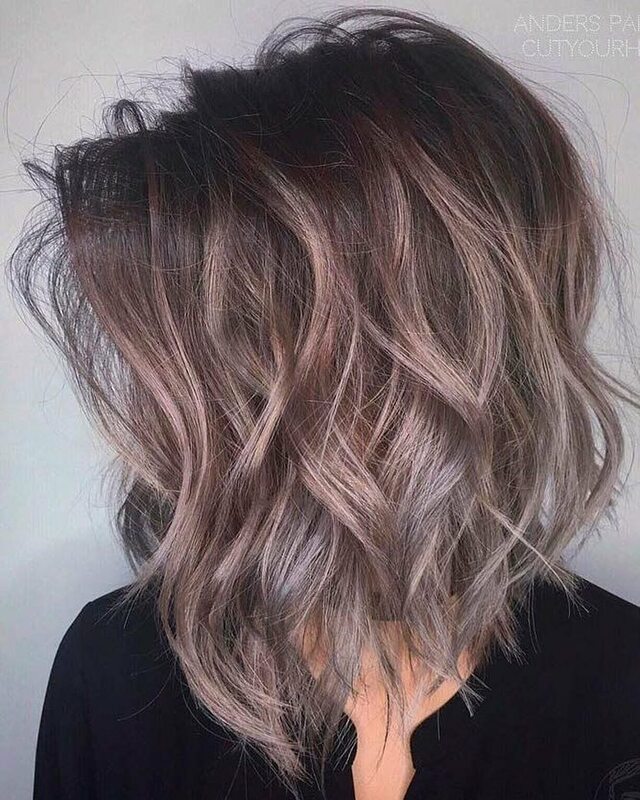 Here’s another attractive, modern twist – warm-brown roots and pinky-beige/lavender balayage with an exciting ‘icy’ finish! There’s a whole, new range of ‘iced’ colors available to colorists this season, in brunette and blonde shades. So it’s a great way to update medium wavy hairstyles! 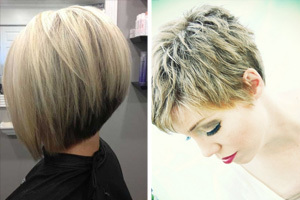 This angled bob has been colored with about 5 differing shades of brown, pink, beige, lavender and gray. And on fine to medium hair, the combo of tousled waves and a superb, hair-color design adds density and incredible style! If you commute by bus or train, you have a great opportunity to look at the back of your fellow traveler’s hairdo. It’s the part that often gets ignored in your morning rush to work! The main ‘fault’ we hair-fashion fans used to see was brunette or gray roots showing up at the crown. However, current hair-color has done-away with all of that ‘hair-color shaming’ and made dark roots a trendy, youthful look. So maybe it’s time to update your urban chic hairdo to the latest charcoal-gray roots and dual beige-blonde. The softer look is a huge trend and flatters light skin-tones with warm undertones beautifully! Another hair mistake that can be very ageing is to add broad streaks of blonde in coffee-brown hair. Going many tones lighter damages hair. And although your thick, dark hair may look fine as you leave the salon, fast-forward a few weeks and the texture will be brittle. However, here’s how to highlight dark hair and keep it looking healthy and natural. 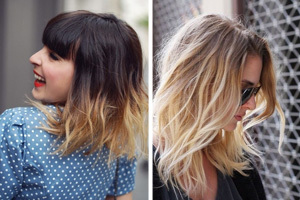 Add fine strands of blonde balayage, carefully placed to soften the face and add color-depth to pretty, natural waves! This trendy medium hairstyle for fine hair, is a great choice if you’re over-25 and struggle to find the right style for your fine tresses. This expert blend of harmonized shades, from warm-brown to mid-gold with copper and beige-blonde touches adds richness and density! Layers, and twisty waves with flipped out spiky tips, add volume and modern edge. And this collar-bone length haircut’s the perfect length for most face shapes. 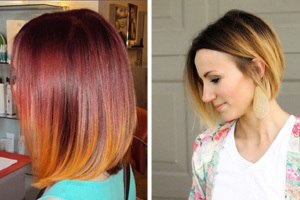 This is a great example of how to use texture, movement and clever color effects for a groovy, medium hairstyle!